Kevin Liles rose from intern to president of Def Jam Records in only nine years. Today, at age thirty-seven, he is executive vice president of the Warner Music Group and has helped discover and direct the careers of stars such as Jay-Z and Ludacris. Liles' meteoric climb from urban street kid with hip-hop aspirations to one of the most successful and influential executives in the music industry is far more than a rags-to-riches story. It is a tribute to Liles' incredible work ethic, wisdom and confidence in doing his thing his way -- the hip-hop way. 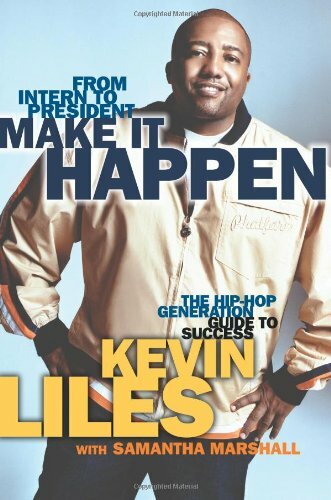 "Every real success story in hip hop comes down to the same thing: someone who finds the will, focus and drive to achieve," Liles writes in "Make It Happen: The Hip-Hop Generation Guide to Success," "It doesn't matter if you are male or female. It doesn't matter what race or religion you are. It doesn't matter what hustle you choose." What does matter, Liles says, is that you fight against the odds to realize a dream and be the best that you can be. You empower yourself and make it happen. Kevin Liles presents ten rules of business success, which range from "Find Your Will" and "The Blueprint" to "Don't Let Cash Rule" and "Play Your Position." As he outlines his philosophy, Liles shares how he put his principles to work, chronicling his journey to the top and the stories of others -- executives, artists, mentors and friends -- he has worked with along the way. "Make It Happen" is both an American success story and a guidebook for the road to having a career and a life you love.